Providing an unique and unforgettable moments, always ensuring comfort, quality and professionalism in any of the eight hotels and six restaurants, it the goal of the Lux Hotels group. The chains based in Fatima, seeks to meet the expectations of each guest and client, personalizing each stay and revealing what each destination has to offer, privileging what is authentic and Portuguese. At the Galeria do Largo, Messagem and Mercearia Eborim restaurants, the Chef Manuel Ferreira prepares an adapted menu to the requirements of the market and the seasons. The cuisine is traditional Portuguese with a contemporary presentation. 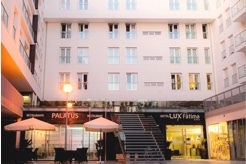 Hotels: Lux Mundi, Lux Fátima, Lux Fátima Park, Lux Lisboa Park, Lisboa Carmo Hotel, Porto A.S. 1829 Hotel, Évora Olive Hotel and Lisboa Pessoa Hotel. Restaurants: Galeria do Largo (Porto); Palatus (Fátima); Mensagem, Maria do Carmo, Salvo Seja (Lisboa); Mercearia Eborim (Évora).